Artist's concept of DARPA's Airborne Launch Assist Space Access (ALASA) system, which envisions using an F-15 fighter jet to air-launch small satellites for less than $1 million each. The United States military's ambitious plan to launch satellites from the belly of a fighter jet should get its first in-air test later this year. The Defense Advanced Research Projects Agency (DARPA) aims to begin the flight-test phase of its Airborne Launch Assist Space Access program, or ALASA, with a demonstration run in late 2015. If all goes according to plan, a series of 12 orbital flights would then commence in early 2016 and wrap up by the middle of the year, DARPA officials said. 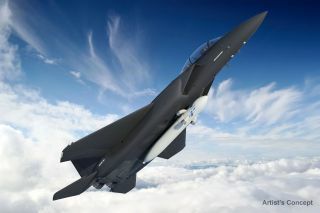 The ALASA military space project consists of an F-15 fighter jet carrying an expendable launch vehicle underneath it. Once the F-15 gets up to a sufficient altitude, the rocket releases and ignites, carrying its payload to orbit. The F-15 would then return to Earth for a runway landing, after which it would be prepped for another mission. The current plan calls for flights to originate out of Eglin Air Force Base in Florida, with launches occurring over the Atlantic Ocean, Tousley said. The goal of the ALASA program is to make launching small payloads much cheaper and more efficient. Indeed, DARPA wants the system to eventually launch 100-lb. (45 kilograms) satellites for less than $1 million each, and to be able to do so on less than 24 hours' notice. Currently, small satellites generally must hitch rides to space with bigger, more expensive "prime" payloads, Tousley said. "So, I have to wait on somebody else, I have to go through their certification; if there's a hiccup with the prime, I wait," he said. "For a whole bunch of reasons, the small satellite, or the small payload market, has not been well serviced to this point. And we think that by going after this, we'll be able to really change the nature of it." While the F-15's reusability should result in significant savings by itself, the ALASA program is seeking to cut costs in other ways as well. For example, engineers are working to develop a new monopropellant system for the rocket, which would combine oxidizer and fuel into one liquid. This would cut manufacturing and operating costs compared to traditional two-liquid designs, DARPA officials said. DARPA also aims to slash the cost of launching bigger payloads as well, with a separate project called Experimental Spaceplane-1 (XS-1). DARPA officials want the robotic XS-1 — which would also be reusable — to launch satellites in the 3,000- to 5,000-lb. class (1,360 to 2,270 kg) to low-Earth orbit for less than $5 million each. The XS-1 program is currently in Phase 1. Three different companies — Boeing, Masten Space Systems and Northrop Grumman — are drawing up designs for the space plane, which DARPA will evaluate. Flight testing is currently scheduled to begin in 2017, DARPA officials have said. Boeing is the prime contractor for the current phase of the ALASA project, known as Phase 2. The company won the contract in March 2014, beating out Virgin Galactic and Lockheed Martin, which also submitted designs.